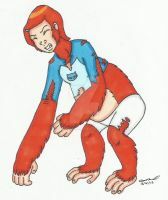 Want to see a picture of yourself transformed into an anthro creature like this? I'll do it for you, you can specify what you want, and won't charge you anything! Click here to get started! Here is the first half of the Orb of the Monkey. Will next work on a commission and then parts 4-7. Story: Her ears accelerated in pain but then started to die down. As the burning-like pain spread halfway down her back/chest, she heard a rip come from her dress in the back. Her spine now felt like it was being yanked on, while her nose felt like it was being shoved into her head.